What is a "Farm Share" or "Community Supported Agriculture"? Farm Shares or Community Supported Agriculture, or "CSA," for short, is a mutually-beneficial arrangement between community members and a local farmer in which the farmer provides produce during the growing season in exchange for payment before the season begins. Each week of the growing season, the farmer harvests the mature crops and divides the produce into "shares," typically one for each member of the CSA operation. 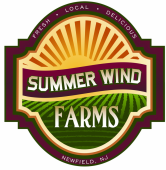 For members who want to pick up at the farm, Summer Wind Farms runs a “market style” CSA, in that each week’s harvest is laid out on display and members come to the farm on a particular day of the week and choose the produce they want within certain limits based on yields and the size of the share the member has purchased. ​We also have other pickup locations available. In these ‘off farm’ locations we pre-fill your box with a great selection of our produce. Since CSA members pay at the beginning of the season, they share with the farmer the benefits and risks of farming that result from variations in the weather, pests and diseases. ​Please visit our vegetable CSA and fruit CSA pages to learn more.